From mid January to mid February, I was in Guatemala visiting artists and acquiring paintings for the 2011 calendar. The trip this year was very successful both for me and the artists. It seemed apparent that competition to be in the calendar is inspiring Maya artists to create higher quality paintings. More artists are searching to find their own style of painting with which to express Maya life and culture. 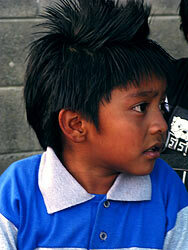 My most interesting photographs this trip were from the Fiesta of San Pablo la Laguna. The young boy at the right was enjoying a hand-pushed ride on a tiny merry-go-round. I liked his hair style, and was lucky to get the shot at all. The other one I took at the same time got mostly wall and backs of heads. 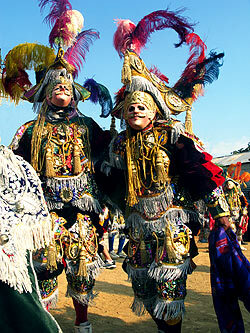 Two masked dances competed at the the fair—Convite (Couples from different towns dressed in their town's traje, traditional attire) and Baile de Torito (Dance of the Little Bull). Two outlandishly dress vaqueros (cowboys) from the Baile de Torito are pictured in a photograph below. Since, until recently, the town festivals have been the most exciting event of the year for most Maya people, the costumes became fancier, flashier, and less realistic because that was what the viewers liked. Many people have asked me when the paintings I got will be up on the web. Although I have the paintings, it takes several months of work to get them catalogued, photographed, the photos processed, and then up on the web. If you want a painting by a specific artist or of a specific subject, by all means ask. I often can find just what you want. While getting the new paintings up on the web, I am also designing the next year's calendar. The twelve paintings for the calendar were selected this last Monday from around thirty paintings by sixteen different artists. I hope the calendar will be out in June, but since my printer went out of business last year, it may take a little longer. 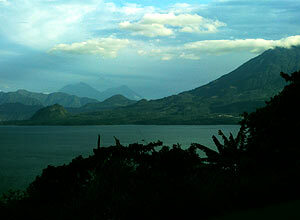 The towns around Lake Atitlán experienced an ecological crisis this last fall when the lake became completely overcome with the flowering of Cianobacteria. Although the contamination has subsided (probably temporarily because it also appeared the year before), everyone around the lake is deeply concerned. Certainly, the people, businesses and towns around the lake that dump their raw sewage into the lake are major contributors to providing a basis for the bacteria to survive and multiply. The pace in which Mayan villagers have had to adapt to the consequences of industrial development has been unnatural—it has not left them time to understand the negative effects of consumerism and of lack of treatment of inorganic rubbish and other by-products. This outbreak cianobacteria may be a mixed blessing because it has awakened everyone living around the lake to to the fact that we are all separately and collectively responsibility for the ecology of our planet, especially the place where we live..
Save Lake Atitlan: This new website run by Greg Anthony Szymanski should be up early in April and will have a monthly newsletter.